GERMAN CHANCELLOR ANGELA Merkel has said that she was ready to lead her party into snap elections rather than risk leading an unstable minority government, after the collapse of coalition talks plunged Germany into a political crisis. “I’m very sceptical” about a minority government, Merkel told public broadcaster ARD, adding that “new elections would be the better path”. In a separate interview with public broadcaster ZDF, Merkel emphasised that Germany needed a stable government “that does not need to seek a majority for every decision”. The veteran leader also confirmed that she was ready to lead her Christian Democratic Union (CDU) into new elections and said she had not considered stepping down after 12 years in office. If new elections are called, Merkel would likely face questions from within her party on whether she is still the best candidate to carry their banner into a new campaign. 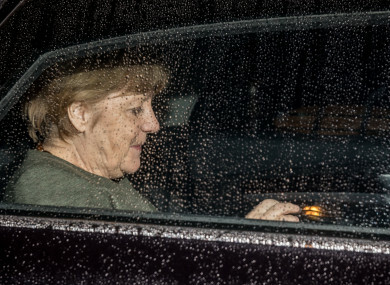 Merkel has been forced to fight for her political future after high-stakes talks to form a coalition government failed overnight, potentially forcing Europe’s biggest economy to hold new elections. After more than a month of gruelling negotiations, the leader of the pro-business FDP, Christian Lindner, walked out of talks overnight, saying there was no “basis of trust” to forge a government with Merkel’s conservative CDU-CSU alliance and the left-leaning Greens. News magazine Der Spiegel called the breakdown in negotiations a “catastrophe” for Merkel and said Germany, long seen as an island of stability in a turbulent West, was having its “Brexit moment, its Trump moment”. Germany’s president Frank-Walter Steinmeier urged political parties to find compromises and avoid snap elections, hours after the collapse of high-stakes coalition talks. Steinmeier, who holds the power to call a new vote, made it clear that this was not his favoured option, as he told mainstream parties to rethink their positions and return to the negotiating table. The failed negotiations, which turned increasingly acrimonious, stumbled on a series of issues including immigration policy. Merkel’s liberal refugee policy that let in more than one million asylum seekers since 2015 had also pushed some voters to the far-right AfD, which captured 12.6 percent of the vote after an Islamophobic and anti-immigration campaign. The parties also differed on environmental issues, with the ecologists wanting to phase out dirty coal and combustion-engine cars, while the conservatives and FDP emphasised the need to protect industry and jobs. It’s likely that Germany now faces weeks, if not months, of paralysis with a lame-duck government that is unlikely to take bold policy action at home or on the European stage. Email “Angela Merkel looked a dead cert to lead Germany again but she's now fighting for her political life”. Feedback on “Angela Merkel looked a dead cert to lead Germany again but she's now fighting for her political life”.